Local 169 BM-ST Bob Hutsell, second from right, discusses a Korean free trade agreement with Matt Vankuiken, at right, a legislative aide for Michigan Sen. Debbie Stabenow. Also participating in the meeting are L-169 members Brent Rosema (foreground), Jim Kaffenberger at left, and Jim Calouette and Mark Wertz (not shown). 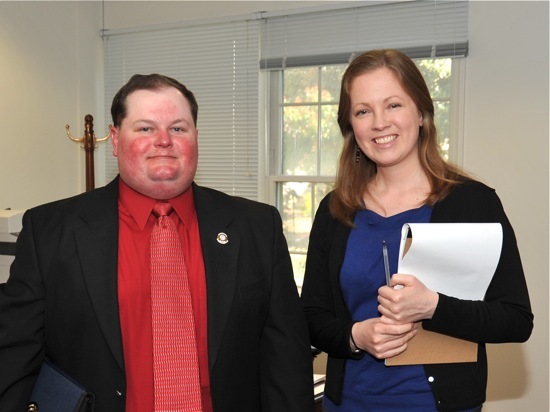 L-40’s Cory Link visits with Seana Cranston, legislative assistant to freshman Sen. Rand Paul of Kentucky. Steve Gromala (L-696) uses his hand as a map of Wisconsin to show Jennifer Nawrocki, legislative assistant to Rep. Sean Duffy, where he lives in the congressman’s district. Gromala and Jerry “Mozzy” Maciejewski (L-107) partnered for the meeting. THE LATE TIP O’Neill, who served as Speaker of the House for 10 consecutive years, authored a book titled “All Politics Is Local.” What he meant by that statement, which he attributed to his father, was that politicians should never forget where they come from — and who their constituents are. As Boilermakers attending the 2011 LEAP conference can attest, that is sage advice, not only for politicians, but for those who travel to Capitol Hill to lobby for their issues. It is a simple but effective concept. When meeting with two aides of Sen. Debbie Stabenow, for example, the Local 169 (Detroit) delegation is quick to remind the staffers of how active the lodge has been in helping her get elected. BM-ST Bob Hutsell, Jim Calouette, Mark Wertz, Brent Rosema and Jim Kaffenberger are armed with detailed background information about all the lawmakers they visit, including how much money the local has raised to support some of them and exactly what the politicians’ positions have been on issues vital to the Brotherhood as a whole and to L-169 specifically. “We’ve always been supporters of Senator Stabenow,” Hutsell tells the aides, while letting them know the local is not satisfied with her stance on the Korean trade agreement. In another lobbying effort, Cory Link of Local 40 (Elizabethtown, Ky.) is on a solo visit to meet with an aide of newly-elected Sen. Rand Paul. Link knows that Paul is no friend of labor, but sometime in the future there could be common ground on a particular issue. He breaks the ice with Paul’s aide, telling her, “I know some of Paul’s’ in-laws from Russellville, where I’m from. Link continues with more small talk before laying out key Boilermaker issues identified by the Department of Government Affairs and the International. Such personalization helps Boilermaker delegates make their visits memorable to lawmakers and their aides. It reinforces the idea that the delegates and many of their fellow members live in the state or district represented by the lawmaker, that they pay attention to what is going on politically, and that they vote. For politicians who live “under the bubble” of Washington, D.C., it’s a reminder that politics is still local.